A children’s classic now back in print with new illustrations What if there was a purple planet with purple people on it? 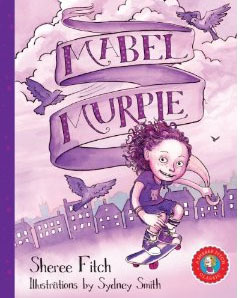 Sheree Fitch answers this question with a zany tongue-twister of a poem featuring Mabel Murple, a daredevil who rides a purple motorbike through purple puddles, skis on purple snow, and on her pancakes pours maple syrple. With a rich and vivid purple palette, Sydney Smith’s brand-new illustrations reflect the wild joy in this classic poem.Originally published in 1995, Mabel Murple won the Ann Connor Brimer award for children’s literature. Sheree Fitch’s first two books, Toes in My Nose and Sleeping Dragons All Around, launched her career as a poet, rhymster, and a'kind of Canadian female Dr. Seuss.' Fitch has won almost every major award for Canadian children’s literature since then, including the 2000 Vicky Metcalf Award for a Body of Work Inspirational to Canadian Children. She has over twenty-five books to her credit, including her bestselling and critically praised adult novel, Kiss the Joy As It Flies. Fitch’s home base is the East Coast of Canada. Sydney Smith is a NSCAD University graduate. Well-known for his artwork for local musicians, he illustrated The Dread Crew: Pirates of the Backwoods. His cover art for Migration Songs won Saltyink.com’s 'Judge a Book By Its Cover' competition. He lives in Halifax, Nova Scotia.